I’ve been catching up on ‘TED Talks’, riveting as usual and the one that inspired this post is by Cameron Russell. I’ve never heard of Cameron before but she is a model and her discussion was based around the power of imagery. This is a broad subject but as she is a model, you can guess that it was about body image and the impact it has on society, I did touch on this in my ‘Carbon copy’ post, following the BBC body image season. Are you in control of your destiny through free will or is it all in the hands of God? Cameron believes that she won a genetic lottery and is one of the many slim white women who are beneficiaries of a legacy handed down from generation to generation over hundreds of years: tall + slender + white skin + shiny hair = femininity and beauty; and she has been cashing in on this legacy over the past ten years, using some of the proceeds to pay for her university education. There are a lot more ethnic models around and I’m sure you could name some just as quickly as you could name a white model? 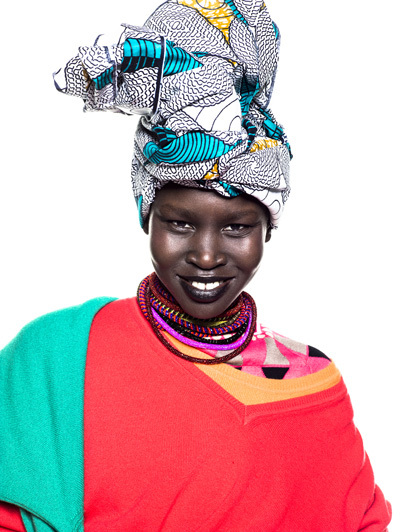 Alek Wek is in the United Colours of Benetton (UCB) spring campaign, but the fact that I’m highlighting this, probably indicates this legacy of beauty hasn’t really changed but just had some ‘intruders’ cash in on it along the way. I would never say, ‘ oh look at Lilly Cole in that Body Shop advert, Cara Delevingne in the new YSL advert or Gisele Bundchen in the new Chanel campaign!’. According to research done by a PhD student at New York University, out of 677 models walking the runway in 2007, only 27 (around 4%) were non-white. I will not digress; this post is not about statistics on the modelling industry but on a legacy of acceptable and desired body image, whether you believe such a thing exists or not. 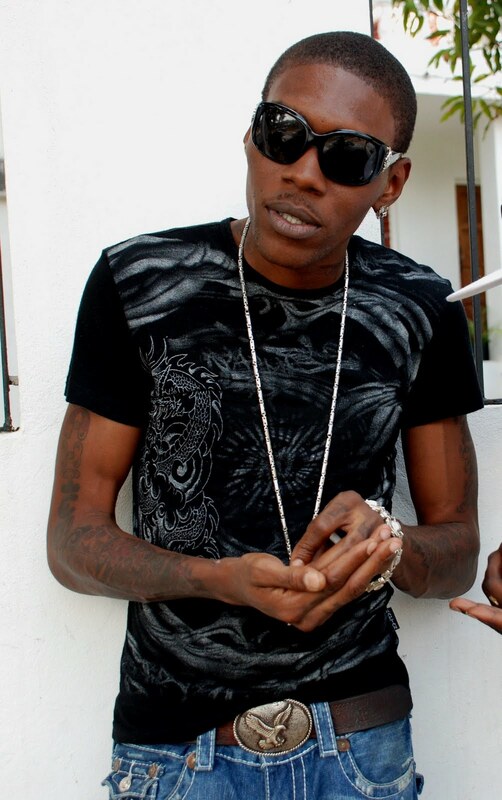 A legacy built my human minds, including hair stylists, makeup artists, radio presenters, magazine editors etc. and all the people who work with them. A legacy built by grandparents, fathers, mothers, uncles, aunts, brothers, sisters and politicians. During her talk Cameron recollects being in a car with a friend who was speeding and went through a red light. They were pulled over by a police officer, said ‘sorry’ and then were allowed to continue on their journey. She believes it was because of the way she looks: tall + slender + white skin + shiny hair = femininity and beauty. For other people in the state where Cameron lives, (New York) rather than cashing in, it seems they are paying a price for the way they look. Apparently in 2012, 140,000 teenagers were stopped and searched in NYC and 86% of them were Black and Latino. They have also inherited a legacy. One of things Cameron said during her presentation that etched into my memory was when she described the difficulty of giving a balanced presentation (because in essence biting the hand that fed her for the past ten years), ‘but mostly it was difficult to unpack a legacy of gender and racial oppression when I am one of the biggest beneficiaries’. No matter how successful we become (however you define success); the legacies bestowed upon us can take effect at any point in our lives, and last a lifetime. Two American music heavy-weights Kelly Rowland and Brandy recently mentioned how they did not feel pretty because they have dark brown skin. This is not uncommon, just part of a legacy they inherited. Skin colour has been a topical issue for years in black and Asian communities around the world regardless of socio-economic status. 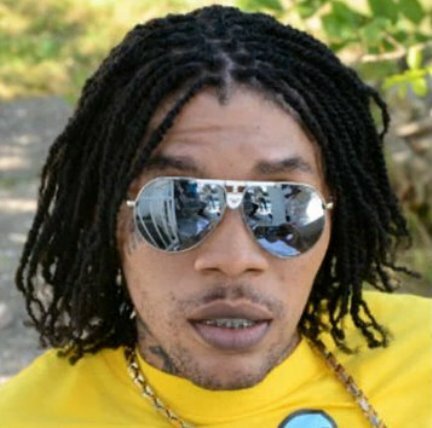 Jamaican dancehall music artist Vybz Kartel caused a shock when he revealed his new look, apparently claiming that the soap used to achieve these results is his own brand which he will be selling in his home country and exporting overseas! One woman who has apparently made millions from combating the skin-bleaching epidemic in her native Ghana is Grace Amey-Obeng, it took her 30 years with a Beauty Therapy qualification from Croydon College in London and $100 start-up cash but now her empire is said to have an annual turnover of around $8-10 million. 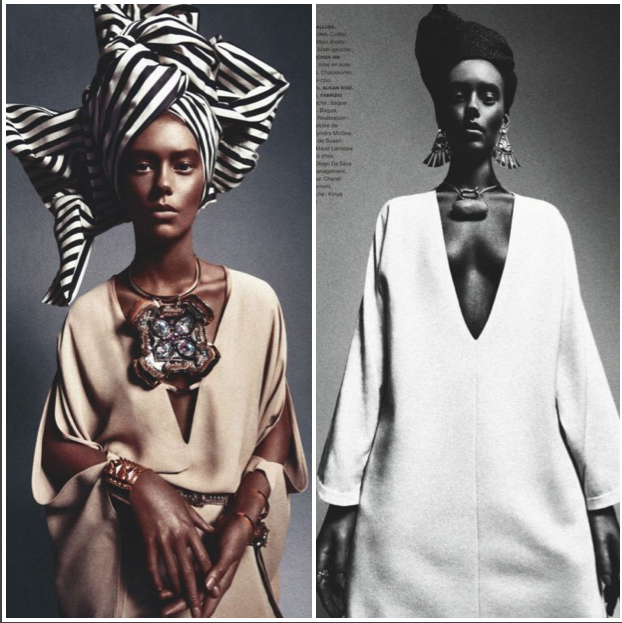 Another controversial image from earlier this year was that of Ondira Hardin, in a French magazine spread called ‘African Queen’; she from North Carolina in the USA. African Queen Ondria Hardin – Black models not required. Thanks! Most of the anger generated from this was not that she is white, but because they sprayed her brown. If the magazine wanted an African model with brown skin, why not use one?! Even if they did not want one with brown skin I am sure they could of found a white South African or North African model? Some people who commented on the Daily Mail website think that the fuss was about nothing, this is just advertising / art, it’s just a tan after all! One comment from Kelly in London reads, ‘Her features are a lot like Beyonce’s – and her heritage is North Carolina so it makes sense that she was chosen for the role’. The obsession with skin colour is blurred, maybe now, it is a matter of what is perceived to be beautiful in western society rather than an inherited legacy? At the same time it seems to be meeting in the middle; people with brown skin want to be lighter and those with white skin want a tan! So I guess those ‘in the middle’ are they lucky ones, inheriting their own legacy? It is a shame that so much emphasis is put on physical beauty, there is no balance… what about intelligence (however you define that)? Click here to watch Cameron Russell’s Ted Talk. Hey Adelina, it’s Busola (from Tania’s afternoon tea the other week)…:-) The race/beauty issue never seems to go away. Ultimately Cameron Russell is right, she is the result of generations of genetic privilege, and I am glad she spoke out and recognised it, because in doing so she highlights the discrimination felt by those who are not as genetically fortunate as her..a discrimination that we are all complicit in creating btw. You know, it’s the idea of epigenetics: poverty/low living standards, hardship, high stress can create minor adaptations in genes which can persist for generations resulting in the appearance that certain social demographics/races are less beautiful or less intelligent. Simply, the better living standards your ancestors had, the more likely you are to be smart and beautiful. Obviously there are many exceptions to his idea, but largely I believe it to be true. And Russell is simply using that to appeal to the western, male-construct of beauty (slim, fair-skinned etc). As for using white models in African shoots, well, African print/jewellry etc is trending right now: the fashion world will always make ‘what’s in’ fit to their body-dysmorphic ideals. Designers have done it for Native & South American fashion (using tan and long, black wigs on models), Chinese/Indian fashion (using ‘slanted’ eye makeup and white foundation on models) etc. It’s a ‘why use authentic ethic models when we can stick to what we know’ mentality. Sadly this is nothing new and will take a loooong time to change. Well said Bee! Sometimes I think we fight a losing battle. People say “the past is in the past”, but it is very much in the present and the future. Legacies, like habits seem to “die hard”. Previous Entry Eating yourself to obesity – A blessing or a curse?